Closer to home is Greenhill Arts, situated in Moretonhampstead on Dartmoor, where this summer they have 35 artists to showcase current work. My piece ‘Blue Scarves’ is part of the exhibition and I’m looking forward to seeing the other work too. I just got a sneak peak of one or two, when I dropped off my picture, and it looks tantalising! ‘Blue Scarves’ is one part of a three piece study and reflection on the recent genocide in Cambodia (1975-79). 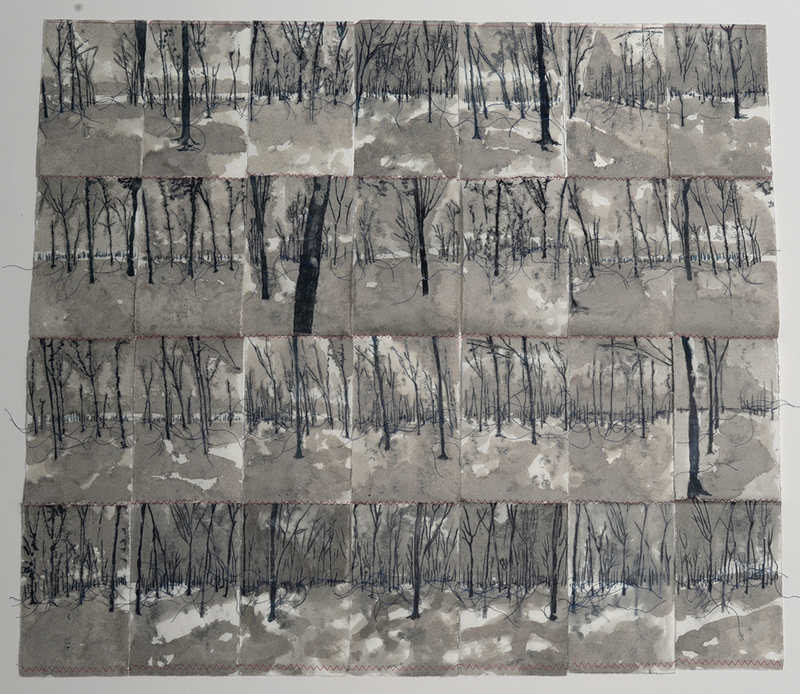 It is a large (80cmx65cm) mixed media piece made from 28 monotypes with ink wash and stitch. These 28 ‘frames’ form part of an animation, which is looped and shows a 360 degree view of a rubber tree plantation in Eastern Cambodia that I visited in January 2017. A partner work “Des Lunettes” is made with monotype, ink wash and burning. Together they are a contemplation on Cambodia’s recent genocide which saw over 2 million peoples killed – among those particularly singled out were people wearing glasses (des lunettes) or blue and white checked scarves (a symbol of the Eastern province – considered to be more Vietnamese than Cambodian). The link to the animation is here.